How did the Jewish community on a tiny island in the Caribbean help the Americans win their independence? Every day more British war ships appeared in Narragansett Bay, blockading Newport's harbor. Trade was cut off, and just about everyone in our little Synagogue community began to leave for safer havens inland. But it was not only the Jews who were fleeing Newport. Hundreds of Christians were leaving as well. Shops and houses were boarded up, ships no longer crowded the port, and church bells fell silent. Only the fog remained unmoved by the British threat. The fog and Herr Marck. Rachel Meares is unhappily married to a German smuggler, in love with a British physician, and forced to spy for the American rebels by her African slaves, who know too many of her secrets, including how her brother and father are smuggling guns to the Americans from a Dutch island in the Caribbean. There seems to be no escape for Rachel from her marriage or from the war when the rebel spy blackmailing Rachel decides to take matters into his own hands. Set against the British occupation of Newport in Narragansett Bay and of St. Eustatius in the Caribbean Sea during the American War for Independence, A Notable Occupation is a story about a young Jewish woman trying to find love in a time of war. A Notable Occupation is on sale now on Amazon for $2.99. 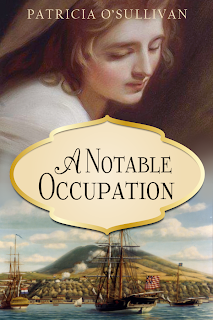 If you get a chance, check out Patti's blog, where she's got some great historical interest articles related to her novels. Fun fact: That island on the cover actually is St. Eustatius. I was fortunate to find this lovely painting by Phillips Melville, depicting the Continental Brig Andrew Doria receiving the first official salute to the American flag in a foreign port from the Dutch fort at St. Eustatius in November 1776.